In his nearly 20-year career with Bohlin Cywinski Jackson, Ray Calabro’s work emphasizes the relationship of a building to its surrounding landscape; he believes that architecture is a thoughtful response to the culture and spirit of each place. This vision and commitment is most clearly demonstrated by the award-winning Grand Teton Discovery and Visitor in Jackson, Wyoming. Ray brings a depth of experience and great enthusiasm to a broad range of building types and regularly leads the Bohlin Cywinski Jackson team in a collaborative design process to achieve extraordinary, award-winning buildings including visitor centers, corporate headquarters, academic buildings for science and research, and private residences across the western United States and Canada. Ray’s passion for architecture comes from his lifelong interest in drawing and design. 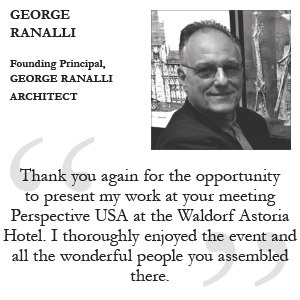 Member of the firm since 1995, Ray frequently speaks at regional, national and international design conferences, and serves as a juror and design critic at leading schools of architecture and design.